Pain: Part 4: What’s in a word? If I said to you, “your spine is crooked” or “you have degenerative changes” What would you think? What if I said to you “your spine was stuffed?” How would you interpret it? Although you may not think it the power of a word can have a significant impact on your pain experience. Part 4 of my pain series looks at the use of metaphors and language and how a simple word can affect our beliefs and behaviors. First of all I would never tell my patients any of the above! Clinicians use metaphors and language everyday to try to explain, in simple ways how we can understand what might be going on in terms of our injury. Some of the language and metaphors used can be a helpful, others quite the opposite being a hindrance. The issue with language and metaphors is that we can take them so very literally. Clinicians first rule is ‘to do no harm’ but sometimes our language use can cause real problems for patients and clinicians may not even realize it. I want to start with a few facts before I get into the exciting and interesting world of metaphors, language, beliefs and behaviors! 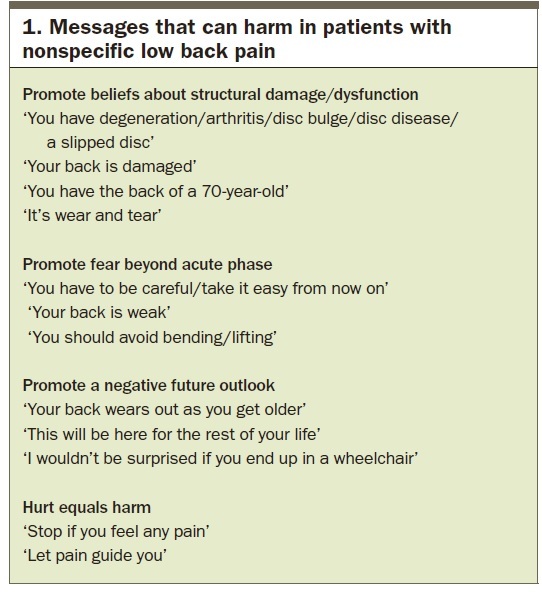 Musculoskeletal (MSK) disorders are the second most common cause of disability worldwide with Low back pain (LBP) being the most frequent of MSK disorders (reference). A recent study in to MSK disorders (reference) ranked LBP as highest in terms of disability (Years Lived with Disability), and sixth in terms of overall burden (Disability-Adjusted Life Years). Prevalence and burden increased with age. That number is growing due to our lifestyles, our sedentary nature and ageing population. Why did I put this up? Well there are a number of reasons that contribute to persistent LBP disability for example studies have shown that use of early MRIs for acute back pain have been shown to have caused poorer health outcomes (reference, reference). Thus contributing to persistent back pain. So MRIs don’t tell us what could be the source of our pain but hey can perpetuate your pain! What else can contribute to persistent pain? Some recent studies into language use have shown that disability can occur from the interpretation and understanding of what clinicians tell their patients resulting in negative beliefs about their injury (reference, reference). So lets delve into metaphors a bit more. Metaphors have been used in healthcare over the course of history in an attempt to explain, makes sense of, contrive or reflect an understanding of what the patient is experiencing at a pathological level. Why do we turn to metaphors? The answer is likely because human nature is so extensive and mysterious and our language limited. In our search for meaning we draw on symbolic language to procure some sense from our experiences. Metaphors can become literal over time thus creating perspective, giving us new ways of visualising the world and how we can act within it. Unfortunately in some cases in our clinical wisdom and through our reductive biomedical training health professionals use of metaphors do not provide a helpful means of understanding those experiences. Medical metaphors are often based upon the pathological nature of the injury, standardized through our medical training or have been handed down from clinicians who have historically implemented them in clinical practice. Instead, medical metaphors should be based on the patients social construct and their concerns/beliefs or schema. (reference). Metaphors and similes are often used interchangeably which can cause misconception; where use of language or words that reflect a different image of what clinicians mean are often not fully understood or are often misinterpreted. One great example is the jam doughnut a classic misconception of our intervertebral discs, but you will read about it all over the internet and it is still frequently used as a metaphor to describe an intervertebral disc. Take a look at our favorite TV doctor Dr Oz in this YouTube clip. WARNING! VIDEO USES POTENTIALLY DAMAGING METAPHORS AND LANGUAGE WATCH AT YOUR OWN RISK!! You can see from the video that Dr Oz used a physical metaphor of jam doughnuts to represent our intervertebral discs. 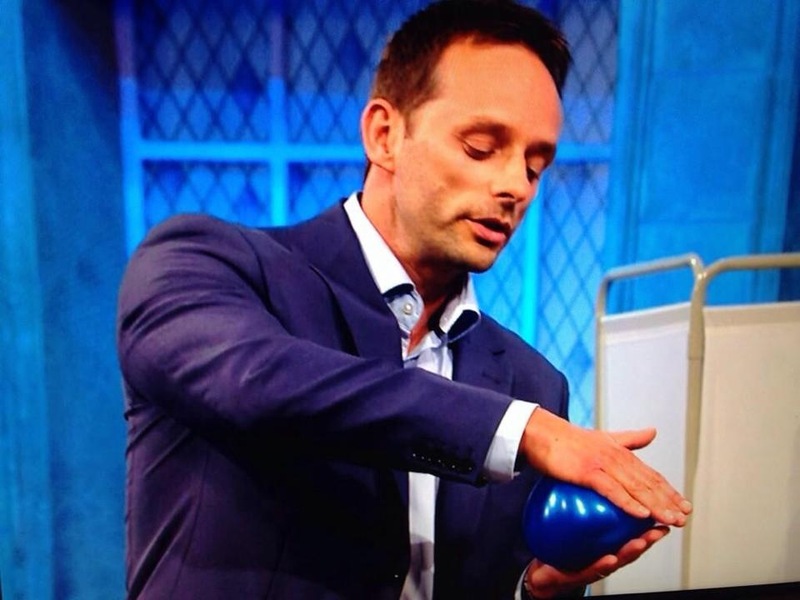 I question the use of jam doughnuts but what I unequivocally object to is the explanation, his body language and how expressive he was in emphasising how vulnerable discs are. This is simply not the case! Another example is pictured below. A balloon is used to describe what happens in the disc when we move. I am not saying this is incorrect as discs are mobile but they are surrounded by extremely strong ligaments and strong muscles. Your back is no more vulnerable than any other joint or limb in your body. Unfortunately backs get a real beating, pardon the pun! So it is the language we use when explaining the metaphor that can cause the misconception. This concludes that you cannot standardize the use of metaphors as everybody will interpret the metaphor in their own way. Around the middle of this year Tiger woods was about to embark on a PGA tour championship. Tiger had been recovering from back surgery back in March and had made what appeared to be a speedy recovery. Posting on his website he released a statement to the press about treatment he had received from his medical team regarding back pain. This was apparently unrelated to his surgery. 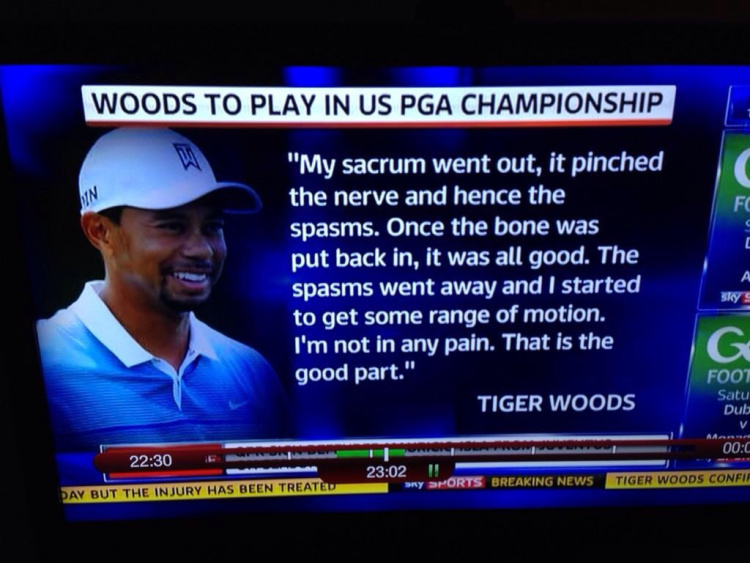 Tiger used some very explicit words to describe what happened to his back, specifically his sacrum. The language that used can give the reader the impression that the sacro-iliac joint is a vulnerable joint and that it can be clicked back into place. Hopefully this has not created a wave Tiger Woods sacrum dysfunction amongst us! To know more read my post on this here. In order to understand why Tiger used these words we have to ask questions regarding the terminology the medical team is using. Tiger is a sports icon we relate to sports icons through the ways they inspire us and motivate us and even influence our behavior. Just to highlight there are numerous studies out there that have shown that the sacrum has a minimal amount of movement but it can be a potential source of symptoms (reference, reference, reference, reference). There have been several other examples of language use that could be interpreted as potentially damaging to the public. 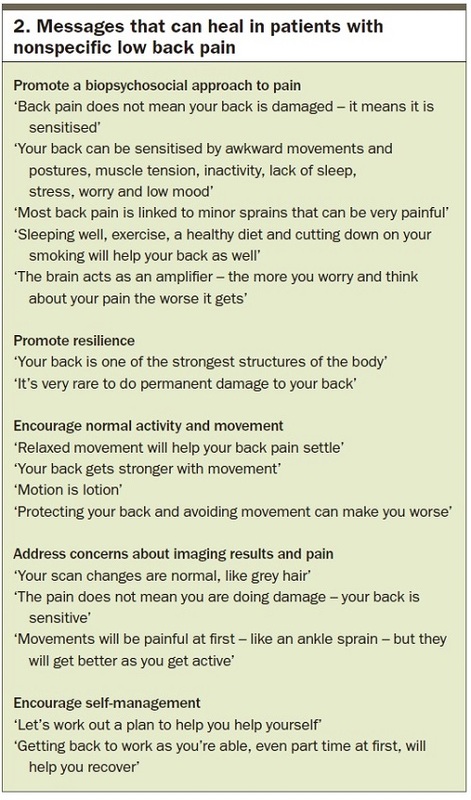 A recent section of a UK national newspaper published an extensive self-help guide to understanding and treating low back pain. Once again the language in the paper was of particular concern as it reflected several misconceptions about the nature of back pain. The question is where did the language come from? Directly from the clinicians or the journalist that interpreted the conversation contriving what was said when putting pen to paper. Lets go through the examples.. This first example for me is particularly damaging! I experiences cracks all over my body and there can be any number of explanations for them. The message I get from this very clearly is that every time I hear a crack in my back I should either go straight to my doctor or better still go to A&E because I may have suffered a vertebral collapse which infers I have sustained a fracture!! I’m going out on a limb here but….. THIS IS SIMPLY NOT TRUE! The evidence suggests that only 1 to 2% of people presenting with LBP will have a serious or systemic disorder. The best predictors of fracture are the presence or cluster of a history of severe traumatic injury, the presence of abrasions or contusions (bruises), prior to corticosteroid use and being a woman over 74 years of age (reference). Another example explains that a sudden onset of pain is most likely a slipped disc. First of all discs do not slip! Secondly, I can’t see how this would be the case as it suggests that your discs are the cause of back pain. As previously mentioned there is minimal correlation of MRI findings that a disc injury is a predictor of pain. There are several structures in your back that have a nerve supply, ligaments, muscles, fascia, joint capsule, nerves themselves. 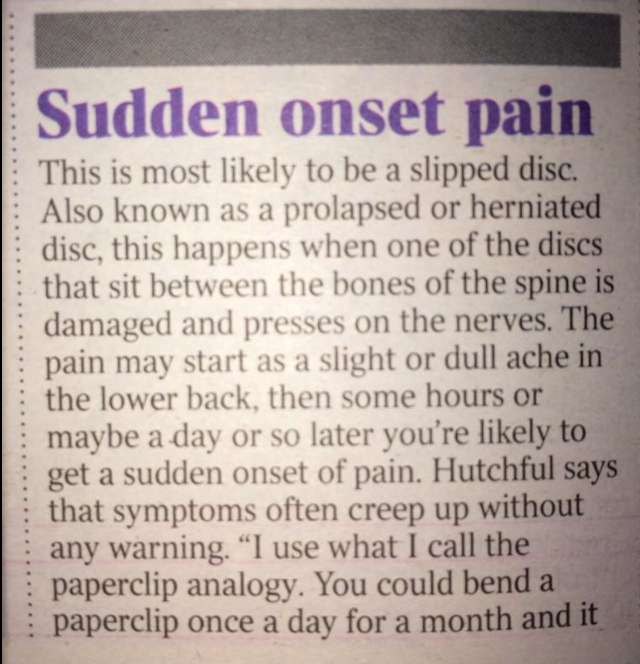 The disc has a nerve supply too but you cannot relate this to being the main cause of a sudden bout of back pain. A more rational explanation for this would be – “a sudden onset of pain can be very distressing and at times disabling for the sufferer. However if you are normally fit and of good health with no co-morbidities it is likely to be nothing too serious. There are a number of immediate things that you can do to help yourself…………………” Can you see how this creates reassurance for the sufferer? My final comments that reflect language use are what clinicians may have said to you presently or in the past and through misunderstanding or unintentional messages cause a downward journey towards persistent pain. I will hold my hand up and admit that I have used messages in the past that I believed was an appropriate way of explaining to patients about how I could help them understand what was wrong and what needed to be done, which in actual fact would potentially reinforce negative beliefs and behavior. The use of language is a skill in itself and requires critical thinking and clinical reasoning in order to avoid further perpetuating a persistent pain state. It’s important for clinicians to grasp an understanding of the patients behavior and beliefs towards their problem. This is not always so easy when you have a limited period of time to establish trust, rapport and obtain a comprehensive subjective examination. 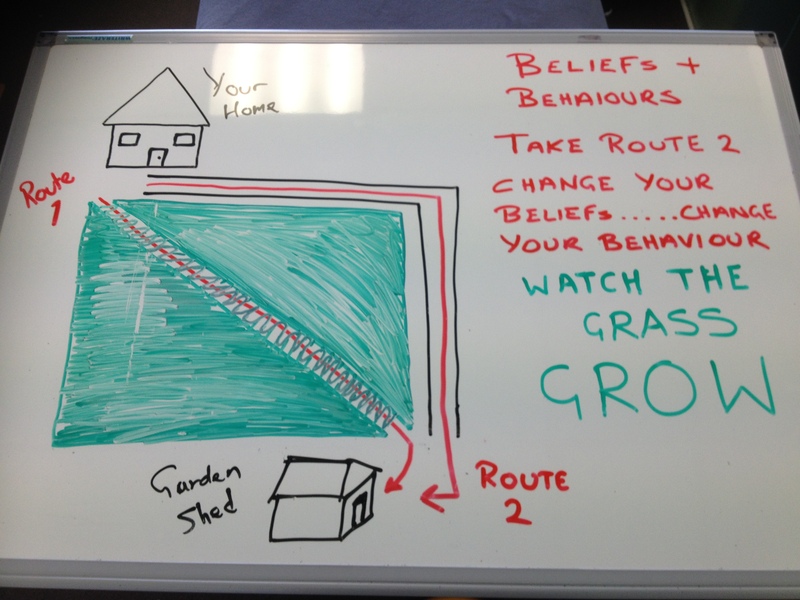 So what has all this metaphor and langauge stuff got to do with beliefs and behavior? Well perhaps you have concluded that language can affect our beliefs and behavior towards pain. There is strong evidence suggesting that what we understand or what we are told about our symptoms can influence our behavior towards pain (reference, reference, reference). Such examples include grimacing, excessive limping, protective muscle guarding and over-reaction to pain reflect examples of catastrophization. Patients attend their G.P. or healthcare professional in order to obtain a better understanding of what is wrong with them. Our beliefs are moulded by what we understand, what we read in the tabloids, what we see on screen, what our neighbour tells us and what a health professional tells us. Unfortunately what makes this all the more confusing is the sheer number of ways that a pathology is explained to us from each of these sources. Having a negative outlook on pain and thinking that hurt equals harm drives fear and anxiety and can delay our recovery. I highlighted in a previous post (part 2) that pain is a good thing. Pain is there to protect us whilst we recover and if used as a guide to recovery it can create a positive belief about facilitating healing, movement and function. This is a perfect example of why horizontal thinking is potentially a better way of delivering the message. If we are all talking and explaining things in a similar way and avoiding hypocrisy perhaps this is better for all of us in the long term, just a thought. So I confess this entire post has focused on how language and metaphors can affect our beliefs and behaviors negatively and I certainly don’t want to end my post on a low note!!! So let’s share a couple of examples of language to promote a more positive outcome. The first excerpt gives some examples of how language can create a positive belief and positively affect your behavior towards pain. Healthy metaphors include language such as motion is lotion or treat the man not the scan. Another example – imagine your back garden and you want to get to your garden shed there is one of two ways that you can go 1) a quick easy across the centre of the lawn or 2) round the edge of your lawn which takes that little bit longer. You have to use the same path every time. Eventually as you continue to walk on path 1 you flatten the grass. You can continue on this path but you will continue to flatten the grass which is surely not what you want for your lawn. Taking path 2 will take longer but at least you maintain the health of the lawn. So in order to take path 2 you need to change your behavior. In the context of pain imagine the lawn as a healthy fulfilling life if you continue on path 1 thinking negative beliefs re-enforcing pain behaviors you will leave the impression of persistent pain. If you take path 2 you have changed your behavior you will still reach the shed but this time the outcome is a healthy lifestyle. A final message to explain the link between pain, anxiety, threat and language is that from our brains perspective threat trumps all other information. If what we read, visualise, touch, hear, perceive is threatening then that is the perfect precursor to pain. Medical terminology can be misinterpreted particularly if we are already worried about something feeling not quite right. An example would be the GPs waiting room. 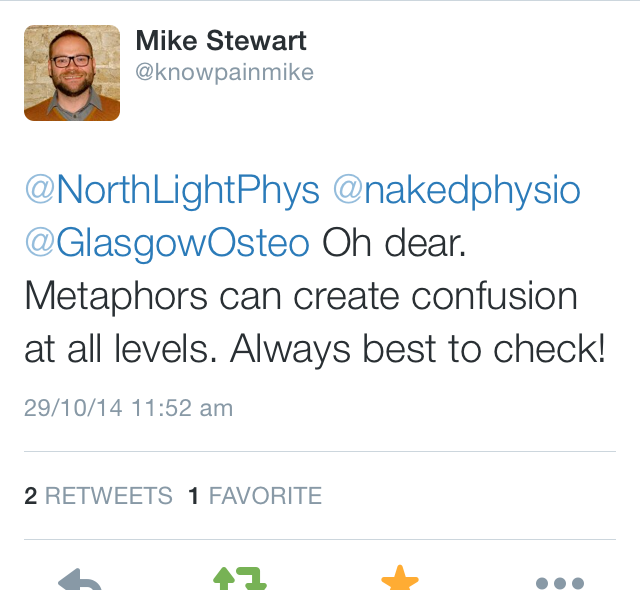 Mike Stewart a Physiotherapy Clinical Specialist from Knowpain (you can view his website here) explains these links on his website and is definitely worth a further look. It has been said that, “Pain is an ideal habitat for worry to flourish”. Unfortunately, without thinking and/or understanding, many healthcare professionals unwittingly increase the brain’s response to threat through the words and images that they use to explain pain. So, next time you are sat in that waiting room, keep in mind that, whilst those words and images on the walls are designed to inform you, they might also be worrying and misleading you. Claire Robertson a Physiotherapist in London has been working on equivalent studies in patellofemoral pain regarding beliefs on the noises we hear in our knees, the words associated with the noises and how this affects our behavior, we are all waiting in anticipation of the soon to be published research paper! So what’s in a word? Well, I hope you have got some better understanding of how language and metaphors can be a hindrance but also helpful to our overall health and when it comes to reading, hearing, discussing information about pain to sit back and think about what the language means to you and how it makes you feel. It’s important that you raise these issues with your healthcare professional. In my final post I will discuss the importance of a holistic approach to overall health and pain management with the intention of covering five specific areas – diet, sleep, mindfulness, exercise and stress management. As always if in doubt consult you healthcare professional. Thanks for reading, your comments are welcomed here or on my Facebook and Twitter pages. Next CrossFit – Crossing the line? What a fantastic article! This is relevant to every conversation with every patient. I think it can be even more subtle than words. Even the sharp inhalation of breath, alarmist facial expression, ooos and aargh’s can all reinforce negative beliefs. Thanks for mentioning my crepitus work. Hopefully will be in press early on next year. As you will see, I think language is a huge component of that! Thanks for sharing your unique perspective. I really enjoy the writing and great research references! Thanks so much for the feedback. I appreciate your kind words about my writing style (I think my girlfriend has something to do with that!). Just read your blog, great read I love your points about being collaborative and share your thoughts on language. It’s fascinating how the wrong word or the wrong tone of delivery can have a festering effect. All the best with your continuing education and graduation into the exciting world of physio! Great blogpost David, really enjoyed it!